My sister in law, Karen, sent me this recipe a few days ago. She knows us well…chocolate and peanut butter. 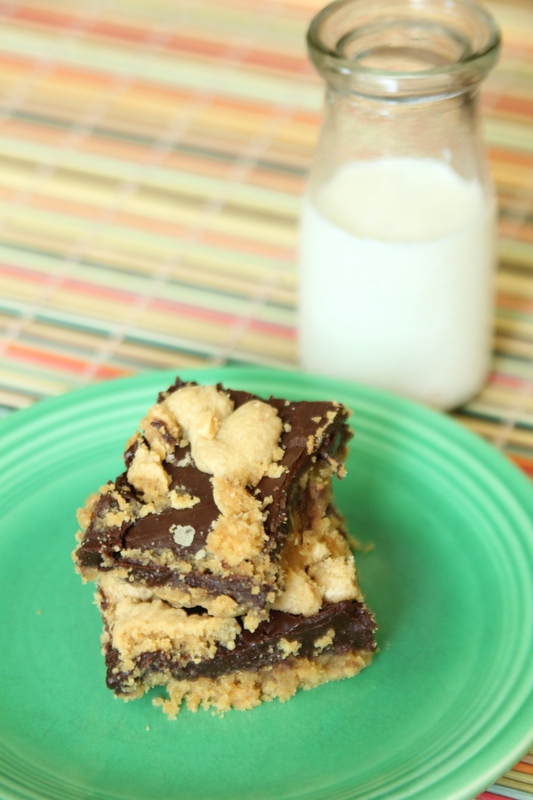 We took these bars to a picnic on Sunday evening…and they are a perfect picnic dessert! These bars are made with a cake mix but taste like a delicious peanut butter cookie, covered with a layer of chocolate. Using an electric mixer on low speed, combine cake mix, peanut butter, butter, and eggs. Batter will be thick. Set aside about 1 & 1/2 cups of crust mixture. Press remaining crust mixture into bottom and partially up the sides of an ungreased 9″x 13″ baking pan. To make the filling, place chocolate chips and condensed milk in a microwave-safe bowl. Heat in microwave for 1 minute. Stir mixture until chocolate chips melt and mixture is smooth. Stir in vanilla. Pour filling over crust in pan and spread evenly. Crumble reserved crust mixture over top of filling. (Mine did not crumble, it was more of a drop, this due to the differences in cake mixes). Bake 30-35 minutes, or until lightly browned. Cool completely in pan before serving. This entry was posted in Bars and tagged bars, Butter, chocolate, Cookie, Peanut. Bookmark the permalink.